Spring is just around the corner. 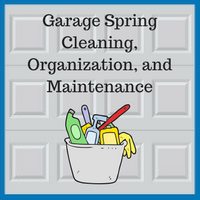 As the weather starts to warm up in the Chicago area and DuPage County, this is a good opportunity to plan for spring cleaning around your home, and your garage is no exception. As you plan to clean, organize, and maintain your garage in the coming months, the following checklist will allow you to stay on top of the tasks you will need to complete. It is best to start by getting rid of all the items in your garage that you do not need or are unlikely to ever use. You may be able to donate items to charity, or you could throw them out at a local dump or recycling center. Sweep the garage out to remove all the dirt, dust, and dead bugs that have accumulated during the winter. Use a shop-vac to clean corners and other areas that are hard to reach. Clean your garage floor using a concrete floor cleaner. If you have kept your car inside your garage during the winter, you may also need to use an oil stain remover. Clean your garage door by lightly sweeping it with a broom, soaping it with car wash soap, and hosing it off. Plan for making the best use of your garage space by installing wall hooks to hang landscaping tools, gardening equipment, or bicycles and using shelves and storage bins to free up floor space. Check all doors in the garage to ensure that they are properly weather-stripped. Ensure that seals fit correctly at the bottom of each door. Make sure your garage door is operating properly, including testing the sensors that keep the door from closing if a person, pet, or object is blocking the entrance. Oil the door’s hinges, tracks, and rollers. Clean out your garage’s gutters and inspect them for damage. Inspect your garage roof for damaged or missing shingles or tiles. Look for damage to garage walls, especially in spots that are dark or moist. Damage to wood can indicate an infestation of termites or carpenter ants. Inspect the garage’s walls and foundation for cracks or mold. By following this checklist for cleaning, organization, and maintenance, you can ensure that you will be prepared to get the most out of your garage in the coming months. If you have any further questions about garage maintenance, or if you are considering remodeling or renovating your garage, the garage professionals at Blue Sky Builders can help you create the ideal garage that meets your needs. Please contact us today at 630-852-8485.